When I heard that my blogger BFF Alana of The Good Girl Gone Blog & her fellow Boston style blogger Amy of Stylish Year were putting together a blogging conference in nearby Boston, I knew I wanted in. 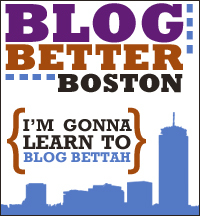 Ever the overachiever, I bought my ticket to Blog Better Boston the very day they went on sale, & I tweeted the word to, um, everyone, convincing some friends to join in the fun alongside me. Imagine, then, my flattery & astonishment when Alana & Amy asked me to serve on a panel for beginning bloggers attending the conference! I happily accepted, & I've spent approximately 50% of my time since then obsessing over the event, which is coming up on March 24th. The resumes of other speakers & panelists for the event absolutely blow me away - the Senior Editor of RealSimple.com, a mommy blogger with 7k+ Twitter followers, big-name brand enthusiasts, forward-thinking entrepreneurs, & presidents & founders of amazing companies. I'd be lying if I said I wasn't a little bit intimidated. OK, a lot intimidated - but I know I bring something unique to the table. I'm not a professional social media person - just the voice of an everyday girl who identifies as a writer above all else, occupying one little corner of the Internet. I may not have corporate sponsorships or hundreds of comments per post, but I've built a nice readership for this here blog (thank you! ), & in the four & a half (!!!) years I've been doing it, I like to think I've figured out the ropes. I can't begin to tell you how excited I am to help others do the same.